Sleep in ease in our Beautyrest Heated blanket with Secure Comfort Technology, which is designed to virtually eliminate ElectroMagnetic Field emissons. The soft flexible wires and ultra-soft microlight plush fabric ensures your comfort. It reverses to a soft berber that adds extra warmth and loft. 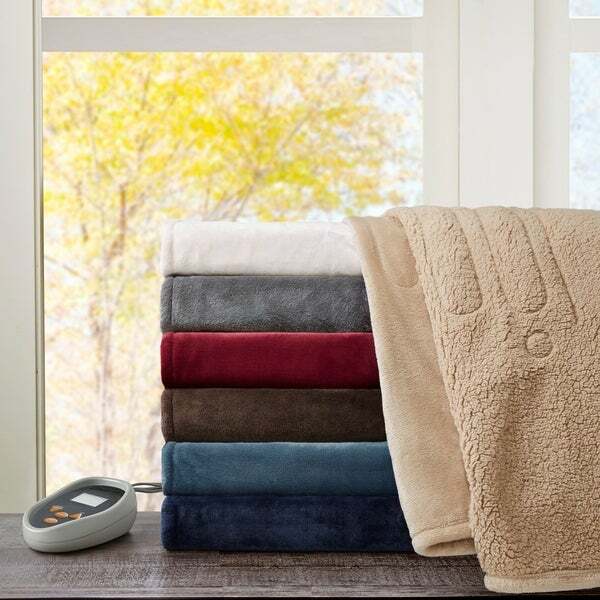 The heated blanket features 10 hour auto shut off and has 20 different temperature settings so you can customize the precise temperature you want. It's also machine washable for easy care. Twin and Full size have one controller, Queen and King size have 2 controllers. Includes manufacturer’s 5-year warranty. Have used Beautyrest electric blankets for years on all sizes of the family beds. They never failed to work and provided even heat for a comfortable nights sleep. Liked the auto off feature as well as the pre-heat selection. Highly recommend. This the most plush and soft heating blanket I have owned - and I have owned several in years past. Specially love that that the controller is upright so I can easily see the temperature setting and that the blanket is turned on, or off. I also like the 20 different temperature settings so I can get it to exactly the warmth I want. My son moved to west coast and with the change in weather there he wanted an electric blanket and after much searching for something comfortable and reading the reviews on this one, I decided to purchase. Glad I did, he loves it. Super soft and doesn't look like other electric blankets I've purchased in the past. I'm a heating blanket snob. I like them large enough to fit our king sized bed, plus I want it to have dual controls for both sides along the preheat option (you can turn it on for 30-60 minutes ahead of time, and it will heat on high for that Time period, then go back to the setting you originally set it for). The preheat time on this blanket is 60 minutes, and this was one of the only heating blankets that had the preheat option that I could find. Both sides of this blanket are nice. One side is a soft micro plush type of fabric; the other sort of like a really soft Berber fabric. Heats up nicely with no issues and we've been using it since November, 2016. My husband and I have been so thankful (and said so!) many times since we bought this blanket about how nice it is to get into bed with this warm blanket already on. It heats up so nicely that we can't use our normal micro fleece sheets we usually use in the winter (it gets too hot). Plus this blanket has 20 heat settings on it. We normally use ours on 1 or 2 and turn down the furnace at night, and it's still plenty warm--I can't imagine turning it up higher than that. Highly recomended--it's a bit more money than I normally pay for a blanket, but it's oh so worth it. Now I'm hoping it will wash nicely, as that's the issue that will usually make or break a heating blanket. I'll try to remember to update this in when I wash it soon. This blanket is soft and lightweight yet you don't feel the wires. The dual controls (I bought the king size) are easy to use and I particularly like the preheat feature which warms the sheets quickly. Having twenty levels of heat may be a bit more than you'll need but it does add to fine tuning the warmth. I plan to buy another of these, in a queen size, for our guest room when they go on sale again. I received this blanket as a gift a few years ago and fell in love. Why had it taken me 30 years to get a heated blanket??!? It's so soft, not like the scratchy ones from the 80s. Then I moved, and this blanket was lost in the process. I promptly shopped for the EXACT same one because that's how much I love it! It's wonderful having all the different settings, the auto-off timer, and the dual sided controls on the Queen (and King). I regularly boast about how amazing my heated blanket is, and wish it was realistic for me to bring it whenever I visited family and friends! I highly recommend. Five stars all the way! I ordered a full size because I only wanted one control instead of two. To my surprise it was large enough to fit the queen size bed. I ordered the burgundy color and it is beautiful! Great purchase! I bought this electric blanket for my daughter as a birthday gift. She just loves it. I was impressed by how soft and flexible the blanket is. It is not stiff with obvious cords running through the blanket. The controls are easy to figure out. Impressed by the quality and the easy care machine wash. I'm currently in chemo treatment and get the chills frequently. I ordered this blanket hoping it would keep me cozy warm and it's done exactly that. Nothing like the electric blankets of many years ago. This is a comforting heat and very easy to control. Couldn't be more pleased with that aspect of the blanket. Even more so, the actual material the blanket is made of makes me feel like I'm wrapped up in my own piece of Heaven. So soft and luxurious. I would highly recommend this blanket. Bought the king size and I really like the Berber on it. Very durable and works great. Great color. Soft, snuggly. Haven't fired up the electric part yet. It's a Beauty Rest, replacing a B.R. that gave us years of good service. Tgis one is nicer. For the price, I could have done better on everything but the promise of no magnetic field dangers. For that alone, if it is true, I am happy with it. It stopped working after 2 months. I absolutely loved it for the short period of time when it worked (it is super soft!) but it is far too expensive for it to stop functioning after 2 months. Keeps us nice and roasty toasty! Have had this for awhile now, and have had no issues. It has washed up well and has even survived the dryer. Quality product that has lasted for awhile. Excellent electric blanket that has a fabulous pre-heat option which makes the bed extra toasty and warm for those cold winter nights. Dual zones for extra options. Super comfortable blanket. Very very soft comfortable blanket. lots of settings. I bought this to use on my massage table at my shop. I love the color too, its a very pretty shade of grey. Bought in November- error codes in April. Needs returned and not replaced. This was too expensive not to work and Overstock leave comments page does not load. Step up and contact me so this can be replaced. So soft and just perfect thickness with fast warming. Unfortunately docked a star because it took so long to ship...10 days to be exact. So missed the cold front but happy nevertheless with the quality. I absolutely love this blanket. The preheat setting makes the bed nice and toasty about 30 minutes before I go to bed. Well worth the money spent! Great blanket but two sets of long wires gets pretty annoying and tangled up easily. Love this model of blanket! I have been using an electric blanket for over 50 years (I had the coldest bedroom in the house and rather than move me to a warmer room, my parents bought an electric blanket, which was a new concept back then). This is by far my favorite--very, soft and very easy to control temperature with a choice of 20 settings. This is the softest electric blanket I have ever owned! I don’t even want to use a top sheet because the blanket itself is so incredibly soft. "Can someone who owns this please let me know if the blanket has dual zone temperature control? For the king size, can one person have the blanket on, while the other has their side off? The answers on here from employees say no, but on the reviews on Amazon for this exact blanket, they say yes to dual zone. Someone that actually owns this blanket..please let me know which is True!" "Are the controllers back lit for visibility at night? Controllers appear to be sitting in a base...is this one piece?" The numbers are visible at night but not the arrows. "Does this blanket have a clicking noise or any buzzing? We've had that issue with other electric blankets before." It is extremely quiet. I don't even know its there when I am sleeping. "It would be nice if Overstock would list weight of all electric blankets in the Specs. What is the weight of this one in a Queen size?" I have queen in Blue and I searched for blankets for years as I dont like anything heavy comforters. This one is super soft and light. "I am looking for an electric blanket that's shuts off after 30 minutes ( or whenever I decide).... Does this blanket have a timer option so I can program it to shut off when I want?" No it does not have a programable timer.But it will cut off after 12 hour,or you can turn it off whenever you like. Not that I can see. I really like the thing. The dial goes from 1-20 in warmth. Quality is great. It does shut off after 8 (I think) hours. "Can you wash this blanket? How do you clean it?" I recommend spot cleaning the blanket. Yes, this blanket can be machine washed and dried. I use cold water for washing and medium heat for the drying. I haven't had any fabric puckering nor any problem with the heat settings since machine washing and drying.
" I'm looking for a blanket that is lightweight and is comparable to this blanket that I bought about five or six years ago the lBeautyrest cozy plush heated electric blanket. It has a preheated program and goes up to 20 levels and doesn't create static electricity. With this blanket here be compatible and if not what blanket would you have that would be comparable? i'm looking for a blanket that is lightweight and is comparable to this blanket that I bought about five or six years ago the It has a preheated program and goes up to 20 levels and doesn't create static electricity. With this blanket here be compatible and if not what blanket would you have that would be comparable?" Yes this would be the perfect blanket. So soft! I just love mine. This blanket is lightweight as a feather. And, further, it is as soft as one as well.I experienced no static electricity while using it during the winter.I don't recall if it goes up 20 levels, but it suited my comfort levels up or down as I needed. If you get dual controls, there is of course a difference in levels of warmth. I love mine! I LOVE this blanket. VERY soft and maintains even heat. I keep it on all day and I have ringing endorsements from all my cats that sleep on it daily. Only thing I noticed was that one of the controls "On" buttons tends to stick when pushed in. I just push it on the side and it comes out. I don't know whether this is a prevalent problem and might just be the blanket I got. Very small problem for an otherwise great blanket. Washes up well too.